Another month of alphabetical blogging? Woohoo, the A to Z challenge is over and I passed with flying colours! Go me, and everyone else who successfully participated! I’m planning on keeping it going this month too, except with a bit of a twist and, of course, less strict a ruleset. Why? Last month was fun, it’s bumped up the quality of my blogging considerably, and to have some solidarity with the people who are taking up the challenge a month late (Mark, Leah), or are still going at their own pace (Sophia). Post titles will continue starting with the day’s letter. Topics will no longer be restricted to a word starting with the day’s letter, though doing so does give you bonus points. Pretty much back to free-style blogging, but with a slightly strict twist that can hopefully wring out some more quality posts. So, today’s been done. The A, as you can see in the post title. Tomorrow’s B. I’ve already got an idea listed for that one. Actually, I’ve got quite a few topics listed already which I couldn’t do because there already was another one occupying that letter a month ago. They deserve a second chance, don’t you think? Also I actually prepared my own meal today, instead of simply warming up leftovers. Look at that beautiful plate of food! Meat and mashed potatoes with gravy, sweet lord! it’s got mouse-over textI’m quite proud of it. Sure, it doesn’t look that amazing, but it was delicious! Probably also because I made it myself. Satisfaction tastes good. Oh and I didn’t really prepare the meat, I just sort of heated it up. But I did do the potatoes and gravy, woop woop! …having cool music playing while cooking made it twenty times more awesome, too. 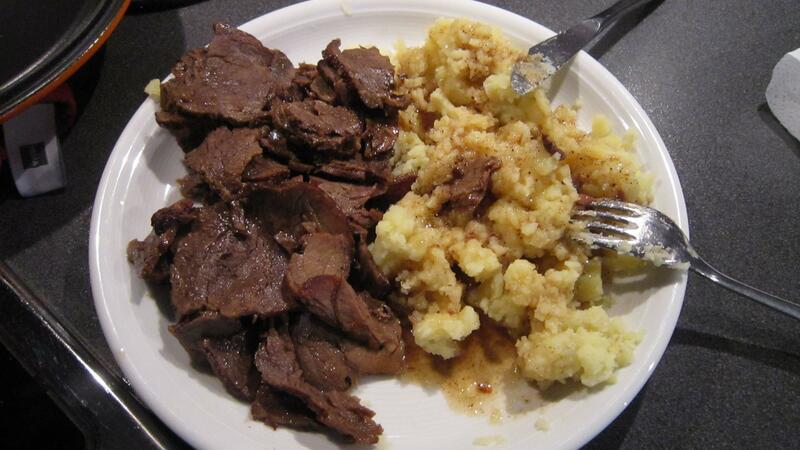 I like how everyone is just commenting on the food >_> It doesn’t get much better than meat, potatoes, and gravy. GRAVY FTW. If you think you can do it then go for it, but part of the fun is having a topic beginning with each letter. You don’t really have to stick to it sure, but it should at least be a theme of the post. Mashed potato and GRAVY!!!! oh gosh!! GIMMEEEE!! om nom nom, looks so delicious!!! Sweet Jegus. You’re home alone, you get to eat any delicious dish you could possibly imagine and you make THAT? THE ATROCITY. No, it’s actually quite responsible I guess, but it looks a little bit less than tasty x’DDD. Cool ideas are cool, though. :’D.